Posted in Series	| Tagged accidentally drop, fall out of my purse, found it, help me look, keys, look, looking for my wallet, looking for something, lost my cell phone, misplace, search, 모르고 떨어뜨리다, 물건을 찾다, 열쇠를 잘못 둔게 틀림없어요., 열쇠를 찾고 있는 중이에요., 잘못 두다, 저는 지갑을 찾다가 좀전에 찾았어요., 제 지갑이 핸드백에서 떨어졌어요., 지갑을 어디다 두었는지 기억이 안나요., 찾는것을 좀 도와주시겠어요?, 핸드폰을 잃어버렸어요. 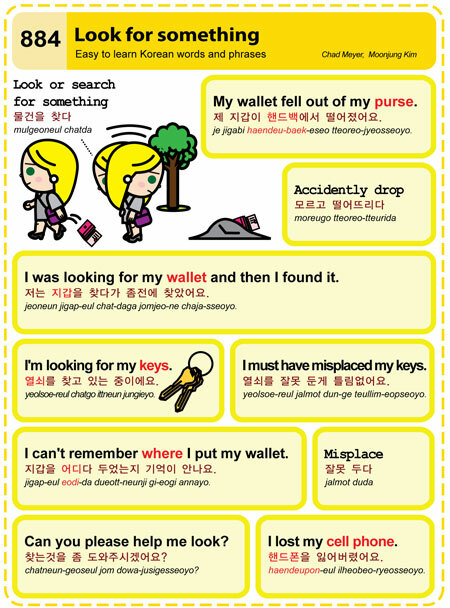 Starting with article #871, I will add both English AND Korean search terms to each article posted on our website, easytolearnkorean.com. Today’s Korea Herald has an interesting article about Korean websites. Believing that it’s safer to keep foreign search engines from indexing all the content on their site, many Korean websites use robots.txt files to block search engine bots from indexing a portion (or all) of their site. The robots.txt files are read by search engine bots as they index websites and the data inside this file lists which pages should not be indexed.